The Merchandise Stand or Merchandise Desk is back (I swear we will decide on the official name for this soon - this fortnight it is Stand). Last time it was all about WrestleMania, I hope you shopped and got lots of Merch to support your favorite wrestlers as well as your favourite Promotions. But it's now the aftermath, the new and fresh ranges from Promotions, Wrestlers and Wrestling Clothing lines have now arrived. Kevin Owens, the man who can cut you down in the ring and with his words easily and with WWE releasing their new range so does Owens. It looks damn good, so much so I can say this another item from WWE's catalogue that you wouldn't look out of place wearing it when not at a wrestling show. Price: £22.00. Available in Sizes S - 5XL. 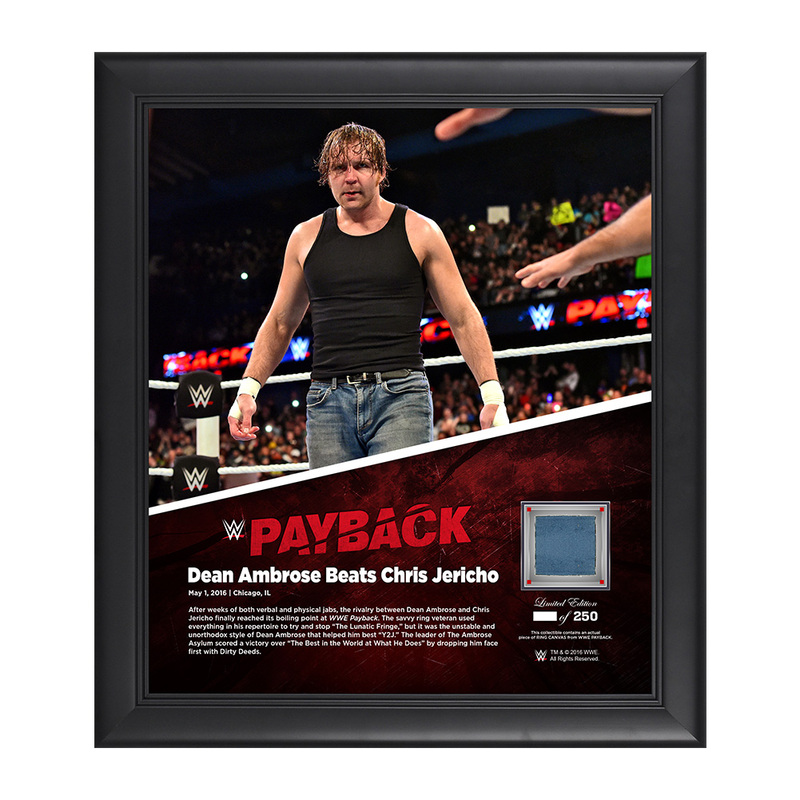 One of many WWE's new Canvas Photo Collage range, and while it may come in at a bigger price, there is a reason for it. That it being an EXCLUSIVE Framed Ring Canvas Commemorative Collage that contains an actual piece of used ring canvas from Payback 2016, nice. Pre-Order - The expected in-stock date is Thursday June 16th 2016. 100 WWE Greatest Matches is the title of the book and you can experience the action, struggle and epic glory of the 100 greatest matches in WWE history. Inside the book is 208 pages of incredible photography from the Promotion's best matches and I'm sure as you read it you'll end up debating who is on the list, who isn't and who should be. Pre-Order - The expected in-stock date is Monday May 16th 2016. Believe it or not Progress is four and abit years old, nope I didn't believe it either but with Progress being Progress they have released this awesome new t-shirt printed in metallic gold for us all to celebrate in the most stylish way possible. Price: £17.00. Available in sizes: S - 3XL. PRE ORDER ITEM. SHIPPING EXPECTED WEEK BEGINNING MAY 23rd. This looks awesome, with a metallic silver print over a black t-shirt just looks brilliant. The Progress Website says Jim Smallman was wearing an early version of this t-shirt at Chapter 29, see if you can spot it via their on:demand service or on DVD as he models it for the world to see. On the Sunday features the Bellatrix event and no doubt one of the UK's most fearsome ladies will be part of it, Saraya Knight. Price: £15.00. Available in sizes: S - 3XL. When people mention UK wrestling family Dynasties, they cannot miss out the Knights, the awesome Ricky Knight, as mentioned the destructive Sweet Saraya, Zac Zodiac and Roy Bevis as the infamous UK Hooligans and finally WWE Superstar Paige. Now WAW has released a t-shirt so you can support them all in one swoop but there are many more different t-shirts available so you support them separately on their own websites. Price: £15.00. Available in Sizes: S-5xl. High Stakes was an excellent show, the main event? Phenomenonal and just what makes this item so good? Limited edition High Stakes 2016 Main Event Poster? Check. 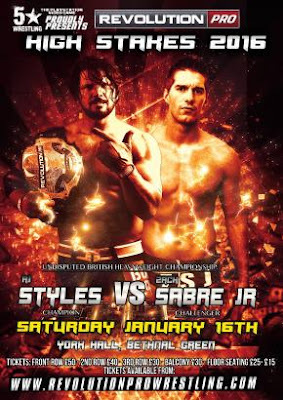 Hand signed by AJ Styles & Zack Sabre Jr? Check. That's me sold. 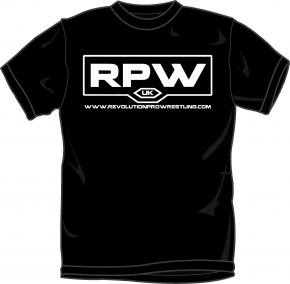 Every wrestling promotion has their own t-shirt, a souvenir to say I was there when this happened, or I am a life long fan of this promotion here's the proof and RevPro hits out with their version and it's pretty damn good. Price: £14.00. Available in sizes: Kids S up to Adults 2XL. Every fortnight I'm going to be looking at wrestler's websites and seeing just what looks good. This week I found myself after watching to many Tommy End and Michael Dante matches (trick comment - you can never have enough of Tommy End and Michael Dante matches) on the Sumerian Death Squad website and what a site it is. This is an incredible t-shirt that just screams awesome, celebrating the Anti-Hero in all his fast kicking and Kickboxing glory. 3X - $26.99. 4X - $27.99. 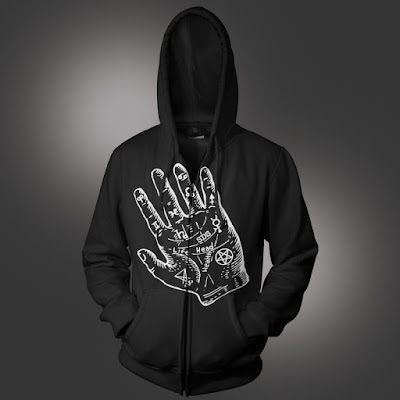 Another fantastic offering by the SDS, a black hoody with an explosive detailed hand design on the front (Esoteric style) just one of the many offerings from the duo who have become world-renowned for their unique wrestling style. Price: $39.90. Available in sizes: M - XL. So, that's us for this week, hope you liked, I'm @craighermit and I'll be back in a fortnight with more Merch goodness. I'll make sure this gets back to Craig :) We love having him on board.